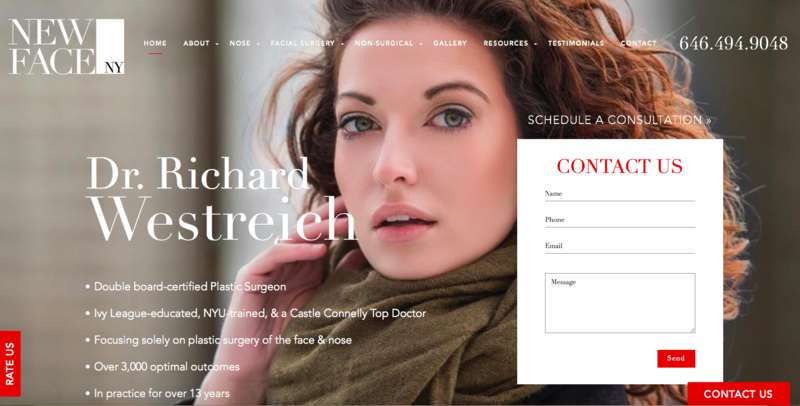 After years of slow online growth in one of the country's most competitive markets - New York City - this board certified facial plastic surgeon, specializing in rhinoplasty, facial fillers, and more, selected SEOversite Turnkey Digital Marketing Manager - our most comprehensive program - to overhaul his entire online presence. Initially, SEOversite managed, coached, and held accountability for his SEO team. 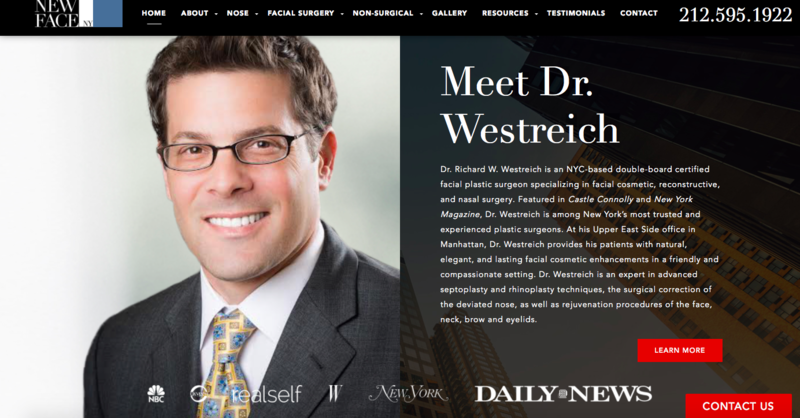 Over the course of the next two years, SEOversite assisted Dr. Westreich in a full website redesign, finding a new SEO team, negotiating best rates, and more which led to a large increase in leads and website visitors. Further, SEOversite started a successful PPC (Google Adwords Pay Per Click) campaign, and helped grow the business by hundreds of thousands of dollars annually. As of the posting of this case study, website visitors year over year have jumped from around 2,500 per month to over 4,500 per month. Cost per PPC conversion has dropped from $374 to under $96, which means 44 high-quality leads were created in a single month for less than the price of one half of one surgery sale. Lead counts in aggregate have also skyrocketed by over 100%, literally doubling potential business generated from the internet. While the old version of NewFaceNY.com seen here was functional, over time it had become visually dated. Bright pink/purple color scheme, small text that was difficult to read, dated scrolling, a non-responsive (not mobile friendly) build caused the site to have penalties, and small pictures all contributed to poor conversion rates and diminished rankings in the eyes of Google and other search engines. As we oversaw the existing online marketing team and awaited the appropriate time to redesign the website given time and budget considerations, SEOversite's suggestions to showcase the doctor, his Ivy League education and training, and other "trust builders" created an effective band-aid. Coupled with better SEO and online marketing, website visitors and lead counts improved, but there was a limit or ceiling. 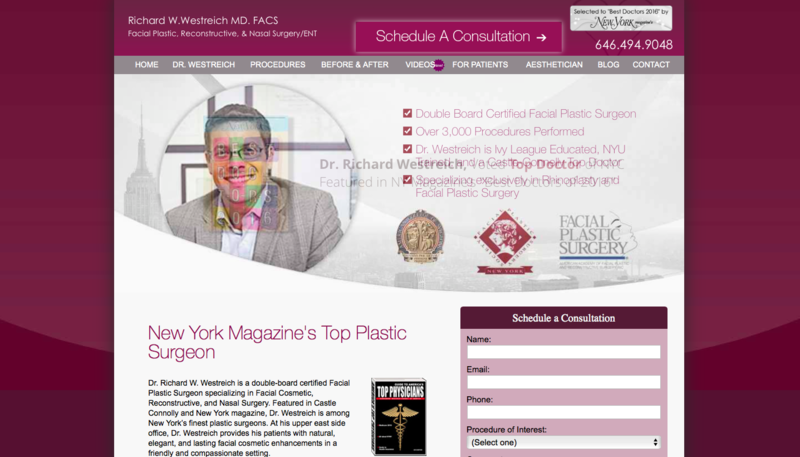 We recommended once we hit that plateau that the doctor redesign the website using a world-class SEOversite Preferred Vendor and invest more heavily in online marketing in the highly competitive NYC market. The newly designed website launched in 2016 resolved many challenges and immediately improved lead counts and sales. Sleek, modern design that is easy to navigate was paramount. Further, simple calls to action throughout the home page and interior pages, plus live chat to ensure lead capture were utilized with strong results. We continued the theme of showcasing doctor accolades, education, and other trust builders throughout the website. Easy website navigation and menu bars helped as well. 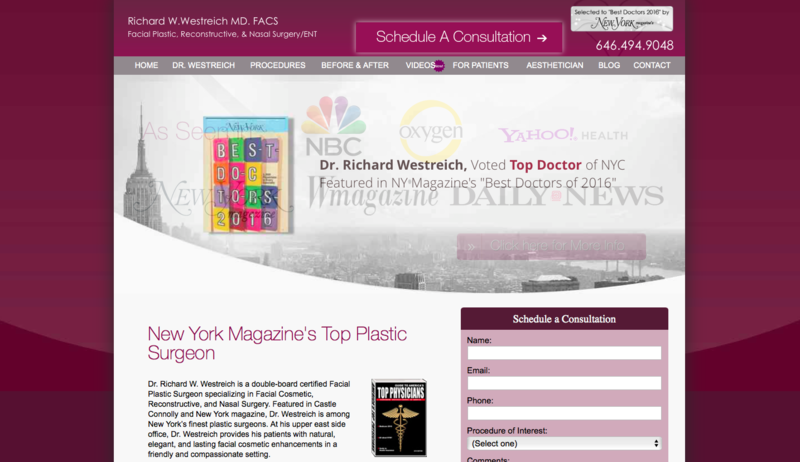 Once patients received key bullet points about the doctor and practice on the home page, above the fold, SEOversite suggested more detailed doctor information coupled with proper and professional photography and high-definition trust builders and logos to further underscore the world-class nature of this elite practice. Following the theme of larger, more modern photography and its impact on website conversion rates and patient purchase ratios, a completely redesigned photo gallery was added that is both easy to navigate and which provides superb close-up photos of patient results. 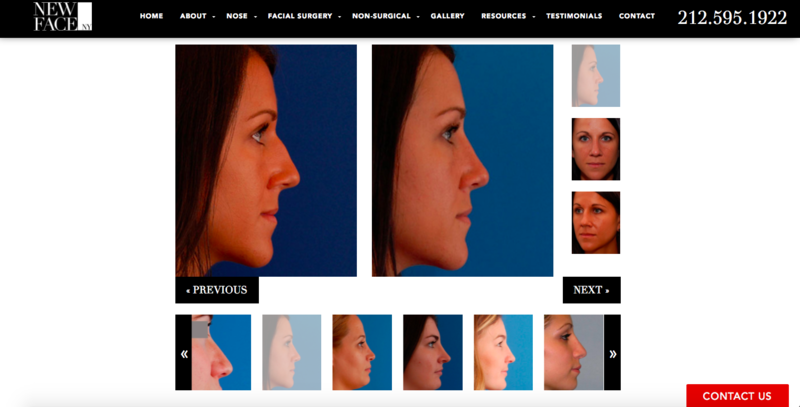 Patient photo galleries are typically the second most visited page on plastic surgery websites, so special attention was paid to offering a unique experience. As lead counts have double and website visitors have grown astronomically, we reflect on what has worked for this website. Like websites in any business, SEOversite must find the balance between content volume (we want lots of it so Google smiles upon us) and easy of navigation/modernity (important for conversion and trust) to be of utmost importance. This website, chock full of content, photos, videos, home page information and more also feels clean, sleek, and easy to navigate. It is no wonder unique organic visitor rankings grow every quarter along with buying patients contacting the practice. 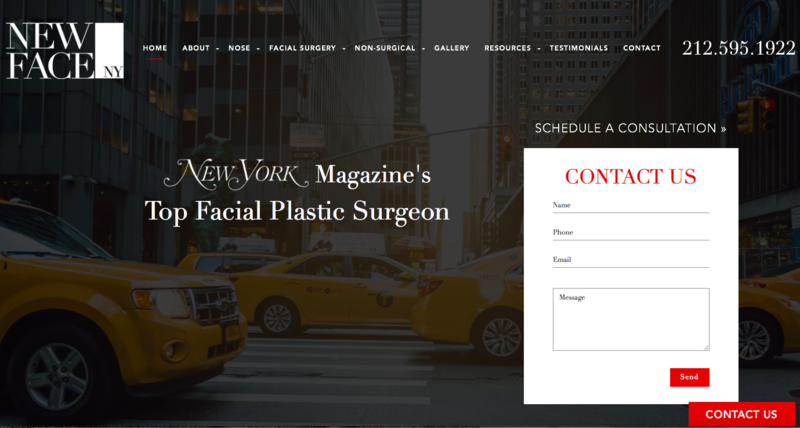 And while this color scheme and layout works for an NYC plastic surgeon, it might not be appropriate for a plastic surgeon in Idaho, nor for an attorney in Dallas. Understanding the business model, ideal client, and sales funnel first is SEOversite's strength. Once the business model is understood, the proper website and online marketing strategy can be built and then executed upon. The sky is the limit in the coming years for NewFaceNY.com and we are grateful for the opportunity to serve this client. The numbers tell the story. This is a snap shot of unique, organic visitors for a 30 day period (the visitors you pay your web team to generate and grow). Year over year visitors have risen over 101% while bounce rate (people who immediately leave the site) has decreased substantially. Pages per session have nearly tripled meaning visitors enjoy the site, are learning and clicking around before leaving the website. How much more business could your company do with 2,000 more visitors to your website each month? Reach out to us at Guardian@SEOversite.com to learn more.